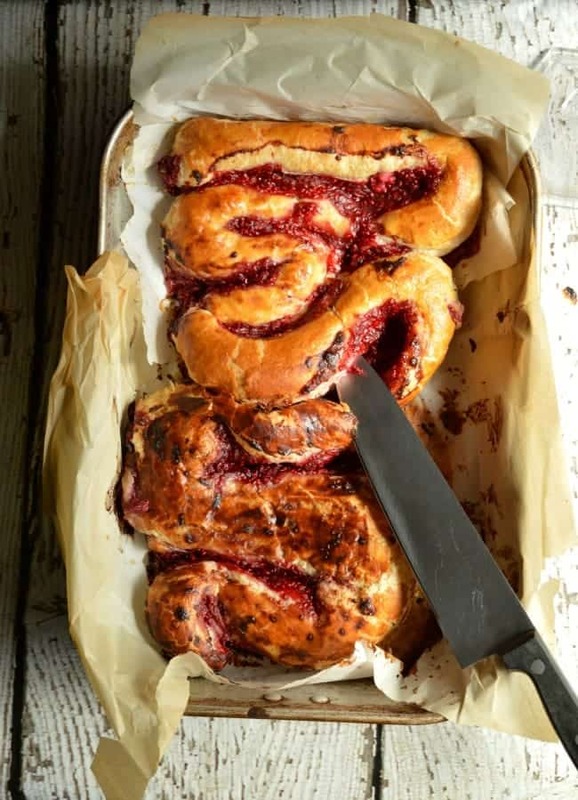 Icky Intestines Bread is Puff pastry that has been filled with sweet cream cheese and raspberry sauce! Then it’s rolled up into large and small intestine shapes and baked for a sweet breakfast or dessert icky good Halloween treat. So… normally it is 100% my policy to NOT make gross looking food. I steer clear of wormy-looking pasta and hot dog fingers on my Halloween buffets because they make me lose my appetite. I broke the rule a little when I made Bloody Good Cheesecake. It was kind of ooky gooky but still… cheesecake. I normally stick to super sweet Halloween treats like these Candy Corn Oreo Pops! 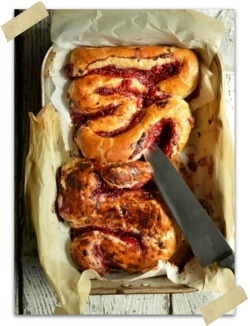 Today I broke my rule a little more with this Icky Intestines Bread Recipe. 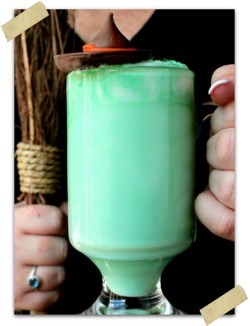 Don’t panic though. It’s puff pastry! And raspberry sauce. And cream cheese with a hint of almond. If you shaped it any other way, this breakfast/dessert pastry would be gorgeous. I just opted to shape mine like intestines and it turned out sort of spooky gross-looking. In the best possible way, though? Every year we up our Halloween decorations game; this year we added a skeleton climbing up the second story of our house. Ghost lady has returned to my front yard. There are skeletons hanging from trees and we added a motion activated ghost that swoops down from the trees and over the driveway when you walk in from the street. It’s pretty fun. 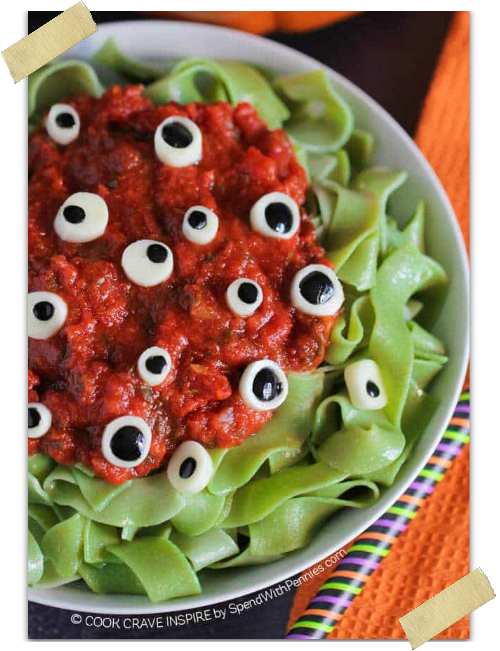 It was high time for me to up my spooky food game. 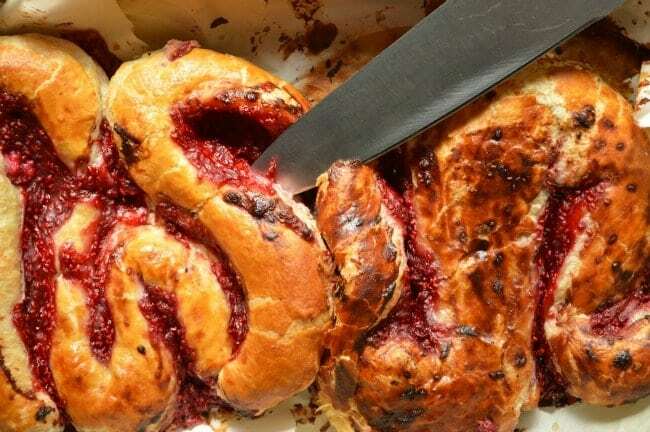 Icky Intestines taste like the best raspberry cheese danish. 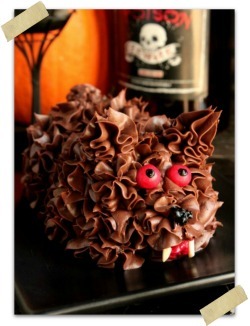 It makes for an extra fun Halloween breakfast or a sweet addition to your Halloween buffet.